The goal yesterday was to sit on the sofa and read several thousand pages in preparation for today's meeting, but at noon I had to briefly vacate the borrowed apartment for a realtor to show his client. Who can afford to buy a beautiful apartment in Manhattan today or ever? Perhaps a Merrill Lynch executive who received a taxpayer financed bonus? 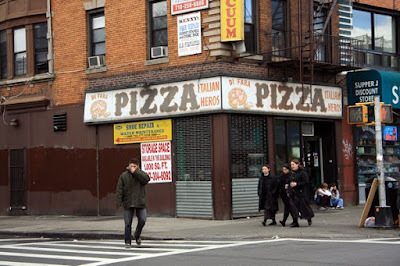 To kill time, I boarded a Q train for Brooklyn to visit the famous pizzeria, Di Fara's. Digression: New York subways. Miracle! For $2 you can ride anywhere in the vast metropolis and you don't have to feel guilty for polluting or pay attention like you do at the wheel of a minivan. As you are whisked about the city you sit back and study your cuticles or daydream about Jon Hamm or read a novel in utter serenity, especially when your children are in California. I left NYC in 1993 and one of the few things I miss is the subway. Another digression: New York City itself. Even greater miracle! Consider the number of people and the diversity -- the anorexic models and the Pakistanis and the black kids on the Q train saying N***** this and N***** that and the Puerto Ricans and the rich white guys in fancy loafers who received taxpayer-financed bonuses from Merrill Lynch and everyone colliding and somehow, mostly, getting along okay. I love my homogeneous California town, but what kind of civilizational challenges do we really face? Di Fara's. I've wanted to eat here for years, but after 45 minutes emerged from the subway in dumpy middle-of-nowhere Brooklyn to find a cardboard sign in the pizzeria window indicating that due to medical emergency they are closed until February. Deeply bummed. Looked around. An Orthodox Jewish neighborhood. The Walgreens featured Hebrew letters and everywhere were cowed-looking women in demure skirts and exceedingly pale, bearded men wearing black top hats and ill-fitting suits. I've noticed that Orthodox males have an incredibly aggressive way of walking. They puff out their chests and barrel forth, scowling, and honey, you'd better step aside! I could see the little boys already acquiring the gait, preparing to trample their bewigged mothers. After strolling around for a while -- very interesting neighborhood -- I boarded the train and returned to the apartment which I have not left since. The rest of the day and night involved reading and consuming cold leftover Chinese food and tortilla chips. Like I say, a sad story. i think you have hit the mainstream nerve with all this merrill lynch bonus talk. i live far away from nyc, and i can tell you it's all anyone's talking about down in these parts. Total bummer about the pizza place that was closed. Cruel. Places like that should close once in a while, just to make sure they're properly appreciated. But they should never close the day you're planning your one visit there.